Or: Hey, that fabric reminds me of Pride & Prejudice! This fabric, a black and white striped linen blend, was purchased a while ago with no specific project in mind. 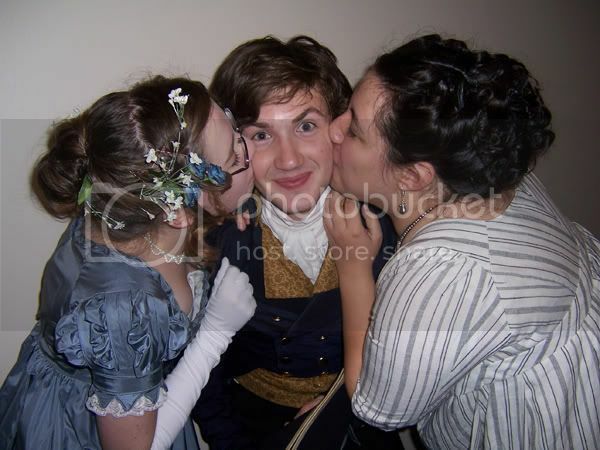 It sat in my stash until the middle of November, when Julie invited me to the next Regency ball in Ann Arbor. Calls were made, people said they would come, and I told Mike, "You do realize this means I have to make a new dress, right?" I was half-joking. And then I went and did it. I spent about a day debating over what to make; I had several options, but I was going to be appearing alongside two or three of the prettiest people I know, most of whom have fantastic outfits, so I (being a little vain) wanted to be able to hold my own. This also lead to me rearranging my fabric stash by time period, because it took me twenty minutes and six crates to find all my Regency-appropriate fabrics, which I found unacceptable. That's when this particular fabric surfaced, though. It would really have made a cute polonaise for 18th century, but when I burn-tested it, it didn't self-extinguish. Since mostly what I plan on doing in 18th century is reenacting-centric and therefore will more than likely involve lots of open fires, that seemed like a bad idea. Photo taken from Costumer's Guide; credit unknown. 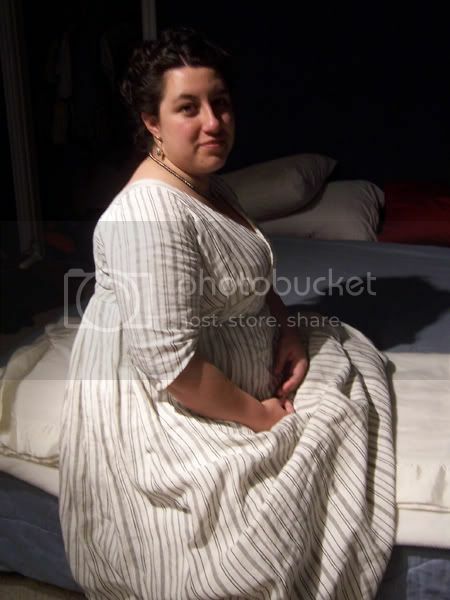 The plan was approved by Tyler and cemented when an old coworker, while over at my house to watch a movie, poked at my pile of striped fabric and said, "This reminds me of that dress from Pride and Prejudice!" Well, when even non-costumers make that kind of call, what can you do? 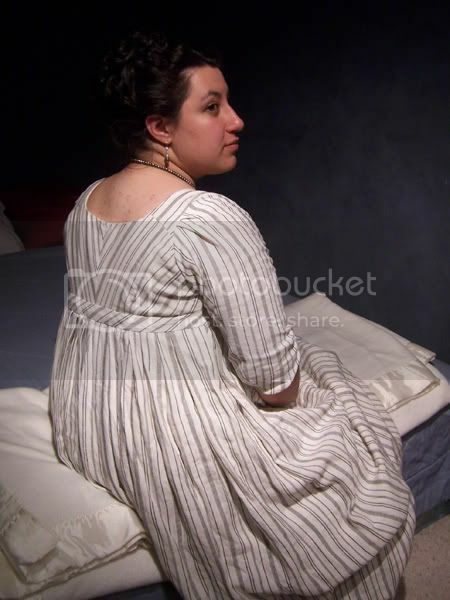 I spent one evening patterning the dress, using my basic 18th century bodice pattern as a base. The source dress has a crossover front, which I basically draped freehand, starting with my stock armscye and working out from there. Just as in Holly's drop-front dress, I interlined the bodice with a crisp cotton organdy to give the fabric a little stability. My outer fabric, like I said, is a linen blend, which means it's pretty springy. That also means that if there's any fullness at all, it's kind of poofy, which made pleating the skirt kind of interesting. I put the back of the bodice together first, since that angled stripe pattern was the main design feature. I actually omitted the embroidery on purpose because the lines have such a nice, clean look that when I pinned the cording down for the embroidered bit, it just looked messy. 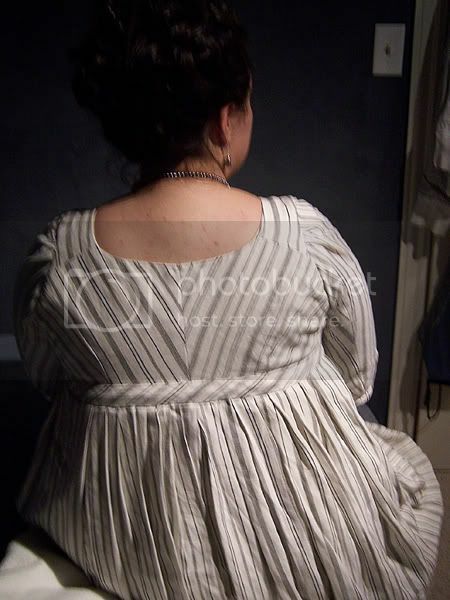 The bodice was constructed, with the linen and organdy layers assembled completely, the sleeves, which are unlined, set, and then the lining, an unbleached muslin, was installed by hand around the neck and armscyes. The bottom of the bodice was left raw and the bias strip for the waistband was sewn to the right side. 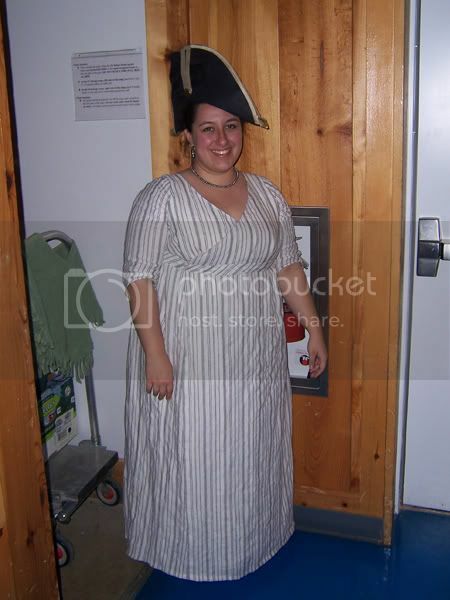 Then, the skirt was pleated (and re-pleated, and then re-pleated again) to a length of twill tape. That was then sewn to the raw seam allowance of the inside bottom of the bodice and the bias strip was tacked to the skirt by hand. That way, the inside of the dress is all finished, but with a minimum of extra steps and extra handsewing. Remember, I'm all about the hand finishing, but I had about six days in which to complete an entire dress! After that, it was pretty much all downhill going. I had my mom help me mark the hem and the front seam where the crossover joins one evening, finished those the next morning, and hemmed the sleeves. 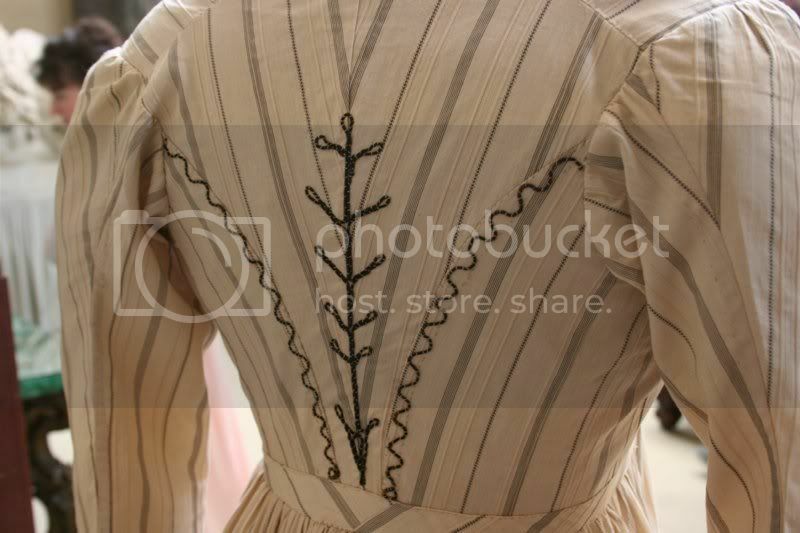 Just a little bit of neatening on the bodice, and it was done! The hat is not mine; it's Mike's, and he's the one who took this picture. He then informed me that I need a hat like this, so that might happen sooner or later. I also took an evening during this one-week project and, instead of working on the dress, I made a new short stay. I've been using the same Regency stay for three or so years now, and it's kind of a piece of junk. It was made in 2005, it never really fit correctly, and the construction left a lot to be desired. While lacing myself in for this project, I popped one of the eyelets out of the back and decided, enough! So using my bodice pattern and referencing the Simplicity pattern, I extrapolated a little support bodice. It worked pretty well! Definitely not perfect, and I fully plan on making another full stay, but for a one-night project, it was a resounding success. And, as a bonus--the old stay was much too long, so I always came away with bruises on my thighs after events. Not a problem this time! And, well, what the heck. At some point, at which I was not paying attention, my life became extremely odd.